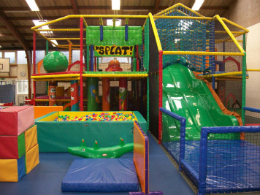 We are now able to deliver dedicated soft play sessions which allow groups of children and adults with additional needs to explore our accessible and inclusive soft play area. The soft play area will be open all day on the below dates for drop in sessions of 2 hours. Both children and adult groups will be able to access the area at the same time. There’s no need to pre-book for these sessions, payment can be taken on the day. Please call our team on 01629 534561 to check availability and make a booking. Pre-booking is essential for the children or adult specific sessions. £4 per person/per session (maximum number of 16 spaces per session and you may be sharing with another SEN group). Payment can be made by cash or cheque on the day of the session. There will be a hoist available within the area and we ask that a group leader stays to supervise the session after a Lea Green Centre member of staff has welcomed you. There is ample free parking at the Centre including disabled parking spaces and the Centre has accessible pathways throughout.